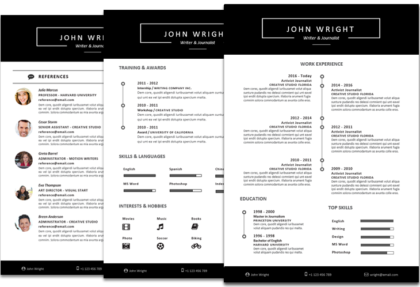 The John Wright resume template – timeline retains the elegance of this specific design and of the other resumes of this collection named accordingly. 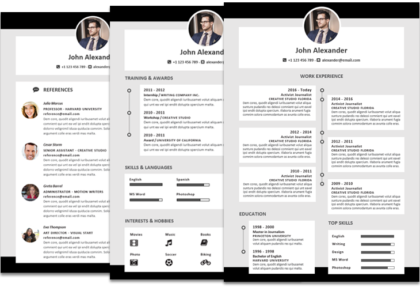 With its wide black header, this sleek resume template grabs attention while providing you with a professional appearance. 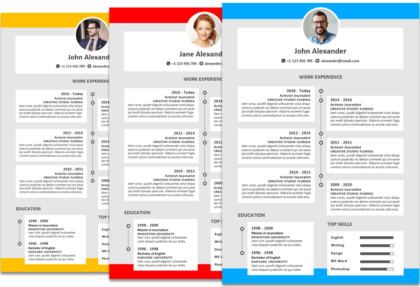 The peculiarity of this timeline resume template is the way the candidate content and information is displayed, in a timeline form. 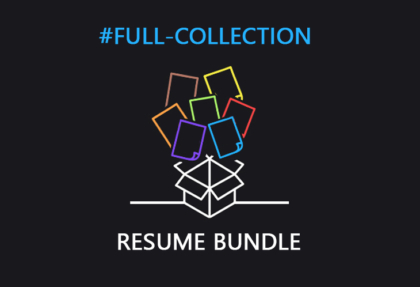 Package 1 includes the first resume page, where the sections “Work Experience” and “Education” have a prominent position and are chronologically displayed, along with a stylish line, the timeline. The most important candidate “Top Skills” are also displayed here, to give them relevance and be available at a quick glance of the recruiter. The “Work Experience” section, even though displayed in timeline form, can be customized just like the other sections, and it is possible to extend it to be full page if one needs to add several work instances, while keeping the chronological style. 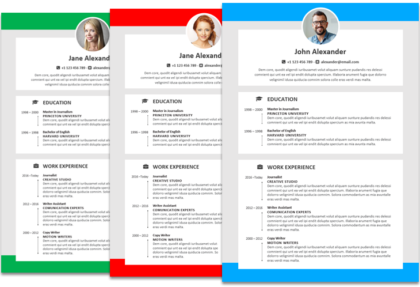 Package 2 also includes the second resume page (“Training & Awards”, “Skills & Languages”, “Interests & Hobbies”), and also a Reference Page and Cover Letter, all matching in style. All those sections can be again customized to be anything needed. For example “Training & Awards” could become a supplementary “Work Experience” or continued work experience from the first resume page. “Skills & Languages” is a helpful section for those candidates willing to show anything that can be assessed by the measuring bars. “Interests & Hobbies” is a section that can be renamed, removed, or customized with some of the 675 icons that come included with any of the packages. The icons could also be used next to the resume headers, whether one would like to change the existing ones, or create new headers. 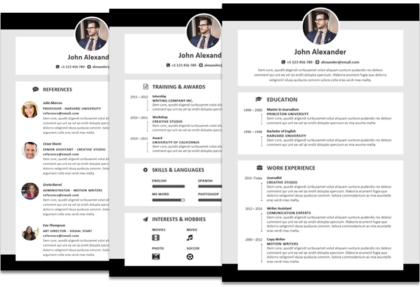 This is a creative resume template that is flexible, just like all the other MS Word resume templates from this collection. I really like this design, it’s simple but professional. 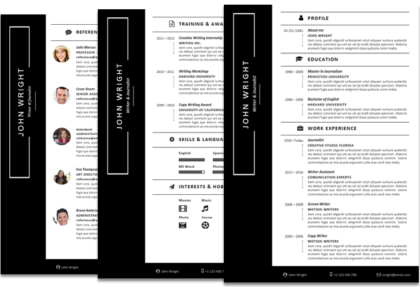 The timeline is a really cool resume template. A chronological resume is something I didn’t find easily. 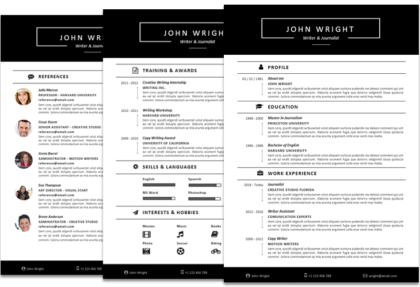 To me it seems a real creative resume template being for Microsoft Word. This seems to be a good curriculum layout for UK, and also for USA. 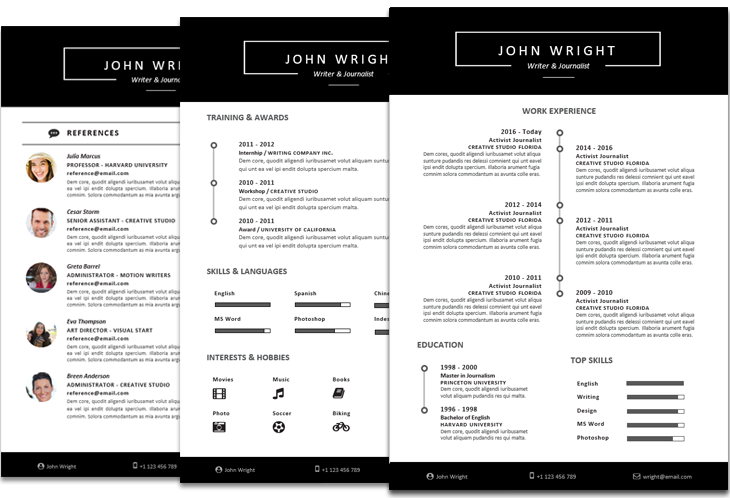 As far as unique resume templates for word, this timeline template is impressive. Well, I consider this a creative word resume, finally! I was searching the best cv templates, I think I found it. What a beautiful resume format in word, I wanted one like this.